The electric start RUGGEDSPLIT Diesel log splitter with hydraulic lift from Powercare gives you total control when splitting logs of small and large size. This heavy duty hydraulic splitter comes with a massive 40 ton rated splitting force and key start 11 HP industrial commercial diesel engines. USA design RUGGEDSPLIT super power wood axe machine is coming complete with a key electric start, road lights, jockey wheel and battery enclosure box. 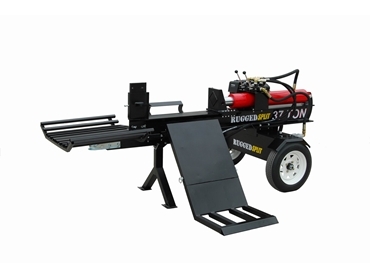 The brand new hydraulic log splitter comes packed in a steel crate and comes complete with basic setup tools, instruction manual and assembly manual on CD. A 12 month part warranty is also included.